I bought 2.5kg last spring (2018) on a local market in France. They were absolutely awful…. now I buy them again, as I did before, either by bags of one kilo or shelled and packed in bags. But there IS a special joy in breaking them open and taste the bitter, spittle pulling but oh so delicious skin over fresh walnuts! They’re not cheap here — so I doubt I’ll ever be buying more than a small bag fresh. You are right — there is something very special about eating them straight out of the shell. Lovely photos. It does seem to be easier to buy them like this in shops these days. Walnuts come with their own very eco friendly packaging, don’t they? I am using my grandmother’s nut cracker. Best ever! I’ve only recently started to like walnuts. They are a very grown up kind of nut somehow. I love the way you’ve softened the colours and made them so photogenic. 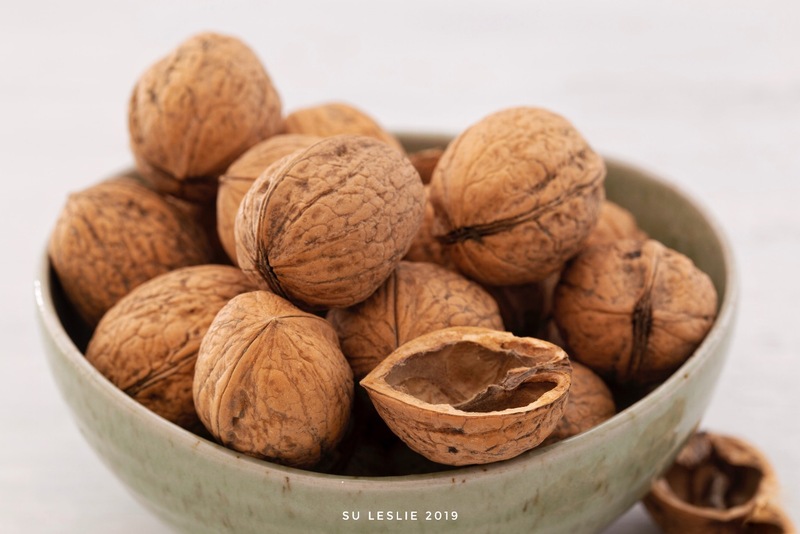 Great photos of walnuts which we should all eat for all its nutritious ingredients. Greetings from distant and still chilly Canada! Thanks Peter. Sorry to hear it’s still chilly. It’s starting to get colder here now. These are everywhere in the autumn here! Squirrels are in heaven and stock up for winter then. I hope you’re putting some in a yogurt parfait:). Lucky squirrels. Mine are costing $9 a bag. These are such delightful soft focus photos Su. And you must have a very good nutcracker! Whenever we have walnuts in their shells they always end up in bits! Or maybe NZ walnuts are different to what we get. And wearing goggles so no shrapnel enters your eyes! There is no shrapnel. The flat on the cleaver splits the shell rather than shatters it. I don’t think I’ve ever had fresh walnuts?! These look so pretty Su – great shots! Thank you 😀 They are really delicious, but very fiddly to get out of the shells.